Whether it is dairy, eggs, tree nuts, gluten, or berries, there should always be something available as a substitute for children that cannot eat these things. We want all campers to experience enjoying food and meals with their friends and staff without feeling left out. This is challenging for most kitchens and not an easy task to accommodate these food allergies without compromising the quality and taste of the food. Substituting for Milk. There are a number of commercially produced cow’s milk alternatives made from soy, coconut, rice, potato, oat, almond, hazelnut, cashew, hemp, flax, sunflower, and even macadamia. Most of these are available in a few different flavors (such as "regular," "vanilla," "chocolate," and "mocha"). All of these milks can be substituted 1-for-1 in recipes. Substituting for Butter. One of the easiest substitutions to make is for butter: simply use a dairy-free margarine instead. Substituting for Yogurt, Sour Cream, and Cream Cheese. Soy-based, coconut-based, and pea-based "yogurt," "sour cream," and "cream cheese" products are available. They tend to work well in recipes. Substituting for Cheese. There are now milk-free and soy-free cheeses available from several brands. They are available in shreds, blocks and slices. 1/2 of a medium banana, mashed. 1/4 cup of applesauce (or other pureed fruit). 3-1/2 tablespoons gelatin blend (mix 1 cup boiling water and 2 teaspoons unflavored gelatin, and then use 3-1/2 tablespoons of that mixture per egg). Xanthan Gum. Add xanthan gum to egg-free cakes and cookies, as well as milk-free ice cream, to bind and add texture. Use about one teaspoon per recipe. Eggs as a Leavening Agent. 1-1/2 tablespoons vegetable oil mixed with 1-1/2 tablespoons water and 1 teaspoon baking powder per egg. Egg White Glaze. Occasionally recipes will use egg whites as a glaze, brushed on top before it is cooked. One good option here is to use melted margarine instead of the beaten egg whites. All-Purpose Flour. There are a ton of options to replace all-purpose flour, many of which are better than the original. We like to use almond flour, coconut flour, buckwheat flour, sorghum flour, almond meal, rice flour, chickpea flour, and brown rice flour. Pasta. There are many options these days for replacing traditional pasta. Our favorites are quinoa pasta, brown rice pasta, zucchini, Squash or other veggie noodles. Food allergies or food intolerances, affect nearly everyone at some point. People often have an unpleasant reaction to something they ate and wonder if they have a food allergy. 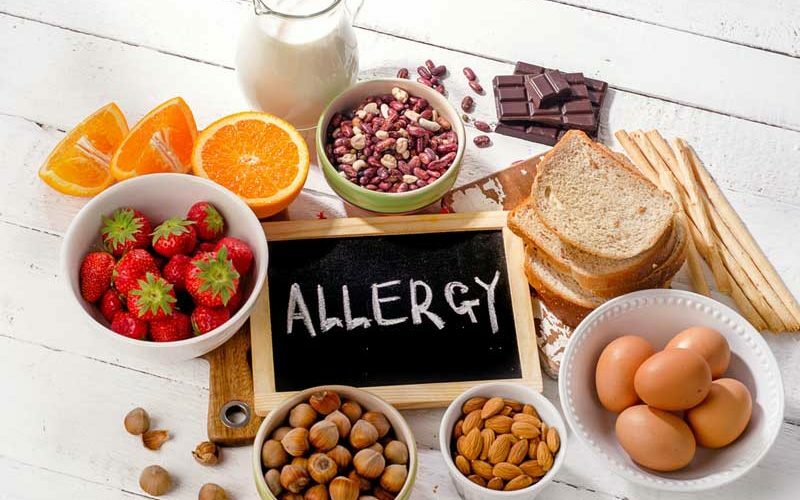 The eight most common food allergens cause more than 90 percent of all food allergic reactions.